Kinsal RC is an upgraded model, sleek, tall, large and ergonomic computer and gaming/racing, office executive chair with a professional style, a high back and a sophisticated support to offer you comfort all day long. You have six color options to choose from: Blue (RC-33), blue and black (RC-15), orange (RC-32), white (RC-11), white and black (RC-34). It is a great leather 360-degree swivel chair with 90 to 180-degree tilt mechanism that is very versatile and that can be used for different purposes. And this includes leisure like gaming and casual computing at home or home office and in normal offices for the best comfort level, especially if you’re sitting at a desk all day long. You can actually lie down on it like on a bed. The blue and black Kinsal Chair has a solid tubular steel frame covered with a high-quality PU leather as well as a starbase. It is a very comfortable chair and offers a maximum amount of stability, weighs 46 pounds with the measurements of 53 x 25 x 9 inches and can hold a maximum user weight of 350 pounds. The height can be adjusted smoothly with the adjustable height gas-spring between 17.5 and 20.5 inches to accommodate people of different heights or your needs. 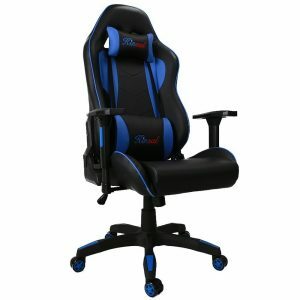 The backrest goes from 23.63 to 34.5 inches, head support and comfy armrests are also adjustable. You have a seating area of 22 x 23 inches, making it suitable for larger people too. But with the way the seat is kind of clutched with wings it may be a little hard for anyone over 260-270 pounds with wide hips or thighs to position their butts comfortably. So the real sitting area without the wings is more like 15 inches. Please just measure how much area you would occupy before you purchase it and decide whether you want to get the regular size or the large. 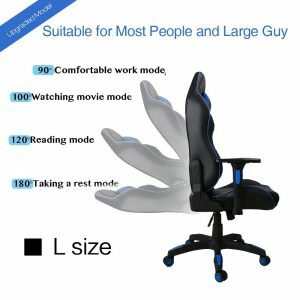 The regular size is OK for a good percentage of people as it is larger than a lot of the regular chairs. You’ll get it in a box that weighs 55 pounds and that measures 33.8 x 13 x 26.7 inches. In the box, you’ll have the ergonomic racing chair, lumbar cushion, and headrest pillow as two great bonuses, the installation instructions manual and basic tools. Kinsal is a US registered brand and you will enjoy both a great warranty of two years including 30-day free return or replacement and customer support with the warranty card including a series number. You can contact the customer service team quoting this number and they will help you the best way they can. With its superior ergonomic design, it will make you feel relaxed while you’re gaming heavily or working in a stressful office. It includes the brand new Universal racing caster wheels that ensure the chair moves quietly and smoothly. If you’re feeling sleepy during the day you can simply adjust it to a lower angle and with the great headrest, removable lumbar support and comfy armrests, take a quick nap and be more efficient at work. It is easy to clean as the decent quality and fade resistant PU leather covering on the chair can be wiped with a damp cloth. It is a high quality, solid and durable, comfortable, functional and versatile chair that looks great with no visible stitching and that will hold up well for many years, at a reasonable price. Kensal is a company that stands behind their products hundred percent.